2018 SKYLOTEC expands its storage area at its main location in Neuwied with an automated high-bay warehouse. 2017 SKYLOTEC turns 70 years old! 2016 SKYLOTEC takes over the Slovenian family company ANTHRON, which is one of the most important manufacturers of special hardware and safety devices for industrial fall protection and climbing. 2015 SKYLOTEC relaunches the 90s climbing wear brand GENTIC. Opening of the Vertical Rescue College in Sweden. 2014 Establishment of SKYLOTEC Trading (Beijing) Co. Ltd. and SKYLOTEC Nordic AB Sweden. 2013 Completion of the new SKYLOTEC administration building in Neuwied. Expansion of production facilities in Hungary by about 1500m2. 2012 Opening of the 300m2 indoor facility at the Vertical Rescue College in Neuwied. Establishment of SKYLOTEC Australia Pty Ltd in Sydney. 2011 SKYLOTEC receives the German "Sicher mit System" seal of approval as a particularly safe employer in the health and safety at work sector. Expansion of Neuwied production facilities by about 500m2. 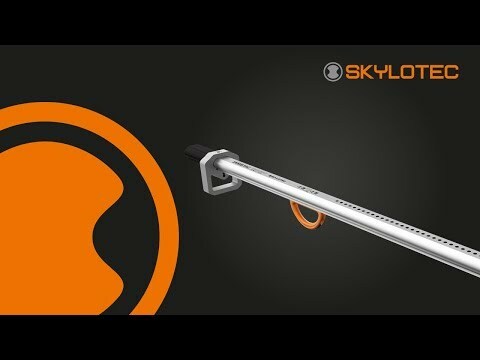 2009 SKYLOTEC revolutionises the market for follow-on fall arrest devices attached to guide rails with the introduction of SPEED. 2008 SKYLOTEC goes Mountain! Introduction of the first SKYLOTEC mountain sports collection. Redevelopment of the shipping department in Neuwied. Relocation of the manufacturing facilities in Hungary to new dedicated premises. 2006 Acquisition of the "Retten + Sichern" ("Rescue + Safety") division from mammuttec AG. Establishment of SKYLOTEC Hungary kft. as a second production site. 2005 Change of company name to SKYLOTEC. Expansion of production. Relocation of main storage and textile production to Plant 2 in Neuwied, Oberbieber. 2004 Acquisition of PEWA Safety GmbH and its SWISSROLL brand. 2003 The "Erste Hilfe und Krankentransport" ("First Aid and patient transport") division is split off to make an independent company, henceforth known as ultraMEDIC. 2002 Development of the MILAN rescue system, which still today is the best descent device with centrifugal brake on the market. 2000 Kai Rinklake takes over as the new Managing Director of the company. 1983 Expansion of the range to include fall protection products for industrial and professional use. 1982 Eduard Kaufmann sells his company to Wolfgang Rinklake. The company Eduard Kaufmann GmbH is established and the head office is moved to Neuwied in the Rhineland.Eduard Kaufmann receives a utility patent from the German Patent Office for the first stainless steel rescue basket, which reduces the danger of sparks during rescue operations. This invention replaces all other baskets in use in German mines. 1973 Production is expanded to include the manufacture of aluminium scoop stretchers. 1969 The range is expanded to include safety harnesses for fire brigades. 1962 Eduard Kaufmann is commissioned to design a robust transportable dressings box to meet first aid requirements underground. He comes up with a round metal container with a lid and carrier straps, containing an emergency supply of bandages. 1958 At the request of the mining authorities in Germany, Eduard Kaufmann develops a fire blanket container with a lid - a galvanised sheet metal container with a glass fabric or wool fire blanket inside. 1952 The company successfully manufactures rescue baskets and safety harnesses for the mining industry. At the time, the latter still consisted of simple leather waist straps. 1947 Foundation of the company by Eduard Kaufmann.